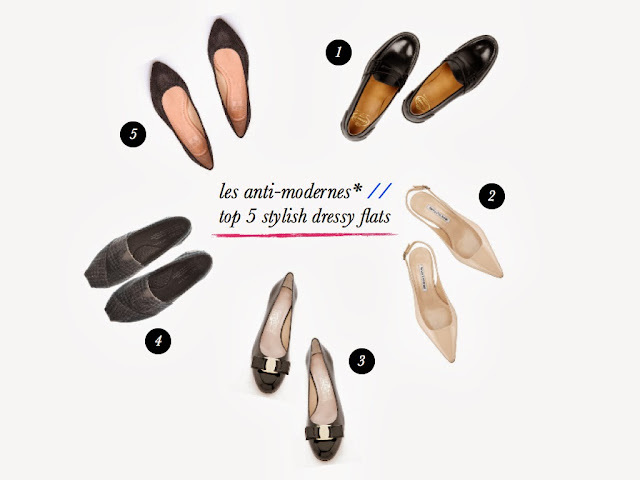 in my last post, longtime reader Erica asked me what stylish flats she could wear to dress up a comfy outfit. read on for my picks! hope this is helpful! what do you think? Loving each of your picks. SO chic. Very nice selection! I like your loafers a lot, very simple but elegant. I love each of your choices and I was able to find most of them for myself, except for the point toe flats and bow pumps both of which I know will be really hard because of my size. I've worn the other 3 styles so much since Spring til now. All yours look perfect in every look! I know this post is about flats, but I just have to say it. You wear those silk shirts so well. I love the way you style them. thank you Olga! that's so sweet of you. i think a cream silk blouse is such a lovely foundation in anyone's wardrobe :) amen to leopard print! Love the Churchs and your EF loafers. And you can't go wrong with Toms for shoes that you just slip on and can run around all day in. I'm actually not a huge fan of flats myself, they can sometimes make my back ache weirdly enough, but even just that little bit of lift like the Church's have makes a difference. PS- you look so chic in those creamy silk shirts, and I love the way the Everlane sleeves are just a wee bit too long. I have yet to find loafers that work for my narrow feet, but i'm always on the lookout. I picked up couple of pairs of Lanvin ballet flats that are so comfy and narrow. You wear your Toms so well. I wish they would make narrow sizes.